Please tell me you’ve read The Mysteries of Harris Burdick. 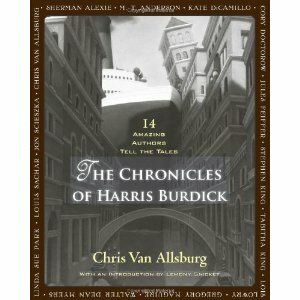 It’s a collection of drawings by Chris Van Allsburg – well, allegedly by Harris Burdick. The editor’s note in the book says a children’s book editor named Peter Wenders had a man named Harris Burdick bring the drawings and captions for 14 stories in to his office one day, promising to bring the complete manuscripts if Wenders was interested. But Burdick never came back, so eventually Wenders published the drawings as “mysteries” in hopes it would lead to Burdick. The drawings and captions are exquisitely enigmatic. So I thought when 14 well-known authors each wrote a story for The Chronicles last year, they would be the 14 best short stories I had ever read. Sadly, I created too much hype. I hate to say it, but the book was a disappointment. Please go read The Mysteries of Harris Burdick if you haven’t yet. Buy me a copy, too, because right now I only have The Chronicles and it’s kind of a letdown.